So there I was—a more-or-less intermediate level tango dancer, with all the bravura that a lifetime of other dance techniques has given me, which means the tendency to show off when I don’t know what I’m doing. I was in a very popular class of what is conveniently called “tango nuevo.” signifying that everyone is young and experimental and in this case, pretty good. We were learning some complicated steps and finding new possibilities with each different partner and I was trying to hold my own along with everybody else. In a beautifully renovated antique building on Esmeralda sits Tango Brujo, one of the most innovative Tango schools in Buenos Aires. Gaining a world-wide reputation as one of the foremost schools for introducing new possibilities in Tango, the school attracts both locals and foreigners from all over the world who want to be challenged by the art form’s cutting edge. Here you will find stimulating and inventive teaching methods for what is often called Nuevo Tango, the evolutionary next step in this age-old social dance that has been recently capturing the attention of new generations of Argentines and foreigners. I wasn’t sure if this was going to be another one of those leads that goes nowhere. 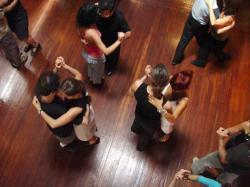 I’m picky when it comes to dance classes, and I had been looking for a good salsa class in Buenos Aires forever. I had been to many, enjoyed them all, but still knew that something was lacking, and that “something” was focus on technique and the variation of rhythms. Finally, at Cuba Mia in Montserrat, I found the salsa class I had been looking for. Picture a large hall with little or no ambiance of its own, filled with young dancers spiraling in and out of each others’ arms. The atmosphere has a lightness, a sense of experimentation, and an air of the future as you watch dancers try out movements never seen before on a tango floor. 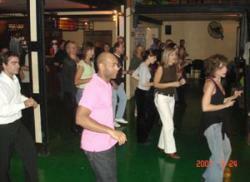 This is the “Practica” at Villa Malcolm, a social club at Cordoba 5064. For the aficionado, it is the place to invent steps, discover new possibilities, and socialize with others who share the same questing spirit. For the novice, this is a place to witness the evolution of Tango as it is being created. You would never know, walking down cacophonous Corrientes Avenue, that behind a pair of old wooden doors lies a peaceful bed and breakfast specializing in housing Tango dancers from far and wide. In a 100 year old building that is as old as Tango itself, you arrive at Tango Paradise in an antique elevator that creates a special feeling even before you enter the beautiful space created by its owner. This page rendered in 0.768 seconds.